Digit... Vibrant or softer colors ... A pixelated rainbow! Now he turned his particular vision into a rug of vibrant colors and other with softer colors. The super photographic enlargement stands out, giving a digital and technological aspect to the pieces. 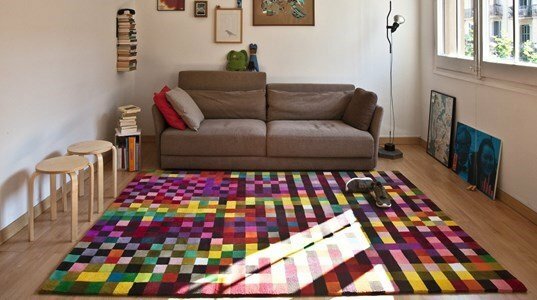 Depending on the light or the moment, a look captures the random union of a small part of the 26 colors that make up the rug, always creating amazing groups in sight. Has density of 86.000 knots/m2. The height of the pile is 11mm and the total height of the rug is 15mm, weights 4,50kg/m2.